TERMINATOR GENISYS is a straight forward film that makes no sense. In its first half hour we are in 2029 AD, in a post-apocalyptic world where a rebel leader called John Connor (Jason Clarke) leads surviving humanity in a fight against a sentient computer programme called Skynet. The rebels destroy the computer but not before it sends back a Terminator robot to 1984 to kill John Connor's mother. So he sends back his number two, Kyle Reese (Jai Courtney), to intercept the Terminator and save Sarah Connor (Emilia Clarke). 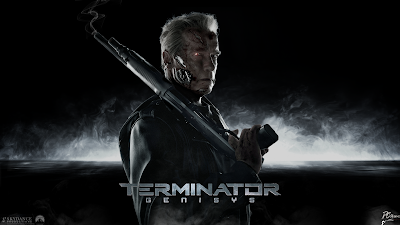 The surprise is that Sarah and an aged Terminator (Arnold Schwarzenegger) are already tooled-up and ready, both for the original Terminator (young CGI Arnie) and Reese. In the second half hour of the film, Good Arnie, Sarah and Reese realise that they haven't prevented Judgement Day, the day when Skynet killed humanity, but merely postponed in to 2017. The humans time travel forward to 2017 and are greeted by an even older Good Arnie and a suspicious J K Simmons with a plan to blow up Skynet again before the release of its deadly Genisys programme. The third half hour sees the biggest plot twist in the film which, once you see it, you'll know it was coming. And this sets us up for the inevitable action packed showdown at Skynet. Clear structure. Unclear timeline. Because this Terminator movie creates yet another alternate timeline, and then another, and still doesn't answer the fundamental question of who sent back the original Good Arnie to save Sarah Connor aged 9. I guess that's what parts 2 and 3 of this rebooted franchise will tell us. It's hard to imagine anyone who hasn't seen the first two movies at least having a clue what's going on here or, indeed, getting the joke. Because this is a nostalgia movie above all else - above it sci-fi credentials and scares. Pay attention to the fact that this movie is rated PG-13. The Terminators aren't as scary and relentless, the action is less impactful, the tone self-referential and jokey. This is a movie for people who delight in seeing Arnie fight Arnie - who delight in his every deadpan line delivery. I'm one of them. But let's be honest. This isn't a Terminator movie so much as a fond walk down memory lane. As for the new additions to the franchise, I really like Jason Clarke as John Connor. He's a great under-rated actor and really has the charisma to be convincing as a revolutionary leader. Jai Courtney is fine as the perpetually shocked and uncomprehending Kyle Reese. J K Simmons is criminally under-used as the cop who met Good Arnie in 1984 and meets him again in 2017. Where the movie really falls down is in casting GAME OF THRONES' Emilia Clarke as Sarah Connor. I get that the film-makers want to play up her character as the little girl to Arnie's father figure, but seriously, she looks ABSURD with a gun. She has no credibility as a proto-revolutionary leader and I found myself hankering after Linda Hamilton's toned, no-nonsense heroine. And my word, Clarke gets the worst of the dialogue and the scene in which she and Reese take of their clothes in a locker room early on is about the most awkward thing I've seen on screen all year. For all that, I really enjoyed TERMINATOR GENISYS. The timelines don't make sense, the dialogue was poor, and Emilia Clarke woefully mis-cast. But every time Arnie was on screen was comedy gold and Jason Clarke was fantastic. Go, and enjoy, but just don't expect a classic TERMINATOR movie. TERMINATOR GENISYS has a running time of 126 minutes and is rated PG-13. The movie played Berlin 2015 and went on global release in the first week of July. It will be released in China on August 23rd.